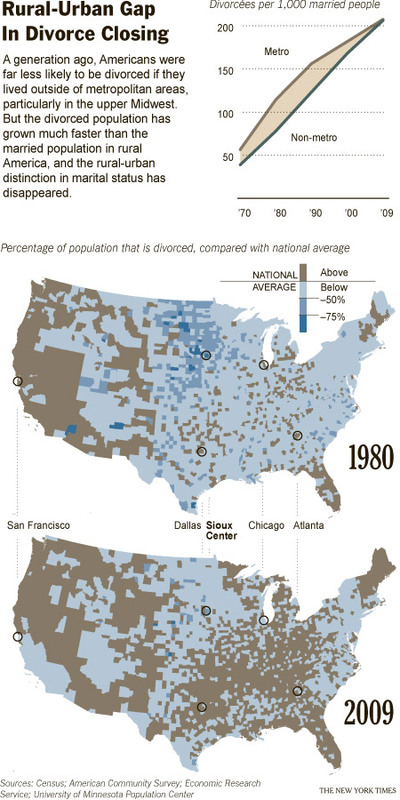 Forty years ago, divorced people were more concentrated in cities and suburbs. But geographic distinctions have all but vanished, and now, for the first time, rural Americans are just as likely to be divorced as city dwellers, according to an analysis of census data by The New York Times. “Rural families are going through this incredible transformation,” said Daniel T. Lichter, a sociology professor at Cornell University. . . . Since 1990, class has become an increasingly reliable predictor of family patterns, Professor Carbone said. College-educated Americans are now more likely to get married and stay married than those with only a high school diploma, a change from 20 years ago, she said, when differences were much smaller. That trend has been particularly important for rural areas, which have fallen further behind urban ones in education, according to census data. Just one in six rural residents have college degrees, far fewer than in cities, where one in three do. Nationally, there were about 121 million married adults and 26 million divorced people in 2009, compared with about 100 million married and 11 million divorced people in 1980. . . .
Less educated Americans are far more likely to have babies while unmarried — and to divorce — than those with college degrees, Professor Carbone said. That trend, once seen as a symptom of urban poverty, has now caught on in rural areas like this one. Leesa McNeil, a court administrator for a district that covers a wide area of northwest Iowa, said that custody cases involving unmarried people used to be so rare that the court did not even have a category for them. “That was a phenomenon that smacked us 10 years ago,” Ms. McNeil said. Source: Once Rare in Rural America, Divorce is Changing the Face of Its Families (New York Times, March 23, 2011). Dependency and Neglect: In re Nirvanna S.